Your sales team represents your company on the front lines with customers. A good team makes your company look good and brings in lots of revenue. A poor sales team can poison the well with customers for a long time to come. How can you ensure that your sales reps have the skills they need? 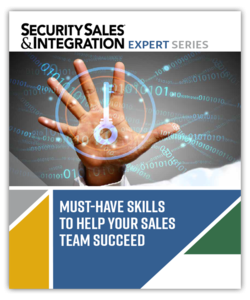 How can security integrators get new salespeople off to the right start? Do you have any tips for managing customer expectations? How do you motivate salespeople to sell new offerings? What are some tips to motivate salespeople to upsell existing customers? How can you ensure sales people mesh with the team and support a positive company image? Download your copy today to get expert insights to help make your sales team more productive.